The elementary years are where the building blocks for all other learning are laid. The child is ready to absorb information and actually finds memorization fun. Students learn rules of phonics and spelling, rules of grammar, poems, and the vocabulary of Latin, the stories of history and literature, descriptions of plants and animals and the human body, and the facts of mathematics. At this stage students are gaining knowledge rapidly through reading, memorizing, and through oral presentations. Teaching methods include regular opportunities to read aloud, comprehension activities and projects, large group and small group instruction, and field trips. Art and drama are also used to enhance all subjects. 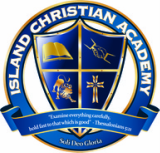 The average class size for ICA is 14 students. We limit our elementary class size to 18-20 students. Our biggest strength is our teachers know each student well and give them individualized attention. Students at this age are excited about learning. They want to touch, taste, see, and smell their world. Attention span is short at this age so activities are adjusted accordingly. The imagination and creativity of these students is strong so they enjoy games, stories, songs and projects. Our teaching methods are designed to fit the developmental stages of our students. At this age we use many tactile items to illustrate points and help guide their discovery and exploration of new things. Use of body movements, singing, playing games, reciting, coloring, drawing and building all help reinforce conceptual understanding of letters, and numbers. Show and tell, dramas, reading, telling stories, and field trips are also a part of our teaching methods. At these grades students are excited about new and interesting facts. They like to explain, figure out and talk about the new things they are learning. They like to repeat clever repetitious word sounds (i.e. Dr. Seuss). Memorizing comes easy for them. Collecting and organizing items is a fun project at this age. Foreign languages are also easily assimilated. The teaching methods at this level incorporate lots of sensory work that includes making collections, displays and models that are used in integrated subjects. Students at this age will recite, memorize, sing songs, and do drills to reinforce the knowledge they are gaining. Simple research projects and oral and written presentations are assigned.